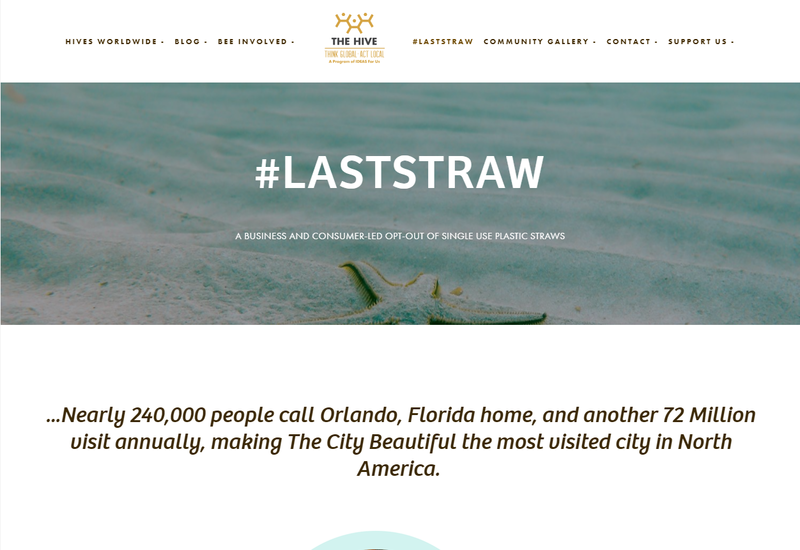 To reduce plastic pollution and its carbon emissions, #LastStraw encourages Orlando residents and businesses to use as few plastic straws as possible in their day-to-day affairs. We choose straws as an easily forgone and substitutable item that could open minds to broader plastic reductions; in fact, we intend this project as a springboard for more ambitious projects aimed at broader reductions in single-use plastic. We promote action and publicize plastic reduction opportunities through a campaign site, community events and adverts, social media, and outreach activities. We also connect with local businesses by showing the financial and social benefits of straw use reduction, offering free resources in exchange for a pledge to distribute plastic straws only on request, and adoption of further reduction strategies through a tiered partnership system. Around the world and the U.S., plastic is ubiquitous and a major source of carbon emissions. A 2009 publication by Plastics Europe estimated global plastic production at 300 million tonnes annually (~330.69 million tons), and carbon impact estimates of PET, the most common plastic, range from a 1:1 to 5:1 ratio (https://alumni.stanford.edu/get/page/magazine/article/?article_id=30619). Estimates mark 50% of all plastic as single-use (Plastics Europe, 2009), suggesting recurring carbon emissions of ~331 million to 1.653 billion tons CO2, and marking single-use plastic as a major emissions reduction opportunity. However, despite its recycling potential, much of it ends up in landfills or as water pollution—a 2014 Columbia University Earth Engineering Center report by Nickolas Themelis & Charles Mussche estimated non-recycled plastics as 13.16% of U.S. landfill mass by weight. To reduce carbon emissions, U.S. citizens must replace single-use plastics with sustainable alternatives. We want individuals and businesses to swap plastic straws for decomposing or reusable straws, or go strawless. Ideally, this behavior will make participants receptive to reducing single-use plastics elsewhere, creating organic drops in single-use plastic demand, consumption, and production. To foster transitions away from plastic straws, our Last Straw campaign asks for pledges not to use plastic straws, and asks businesses to give straws only on request – and ideally, swap plasticware for sustainable alternatives. We intend the campaign as a launchpad for larger projects tackling overall plastic pollution. While plastic straws are a minuscule portion of overall plastic waste, by starting with straws—a small, exchangeable, often unnecessary item—we hope to show the feasibility of doing without single-use plastic. We also introduce plastic-reduction behaviors and alternatives to plastic, and identify businesses that go further in plastic reduction through a tiered partnership system. To stress alternatives to plastic straws, we offer facts and media about plastic pollution and carbon emissions, and their harm to aquatic life—and, by extension, humans. By exposing threats to human and ecological health, we create emotional appeals to encourage behavior changes. We also frame Last Straw actions as social incentives: by pledging or going straws-on-request, people and businesses demonstrate both environmental stewardship and thrift. Choice architecture features in how we present arguments—we note that people and businesses can still use straws, but can do good by using fewer and more sustainable versions. On-request models also don’t disrupt business operations much, allowing restaurants to ease into sustainable behaviors. Our solution promotes awareness of the single-use plastics issue, encouraging transitions away from plastic straws toward sustainable alternatives and promoting broader reductions in single-use plastic. We use multiple public awareness channels, as well as community events with readily-available alternatives to plastic straws. We also host a website that encourages visitors to pledge against plastic straws, offers additional waste-reduction tips, & showcases eco-friendly vendors. Finally, we present financial & social arguments for local businesses to give straws only on request, as well as swap plastic straws for sustainable substitutes. To boost individual awareness, we work with local partners to create billboards, online banners, and social media posts to publicize and direct people to our site. We’re also holding a Phone Hack-a-Thon where volunteers will call local businesses about #LastStraw and request support, particularly if businesses express environmental concerns. 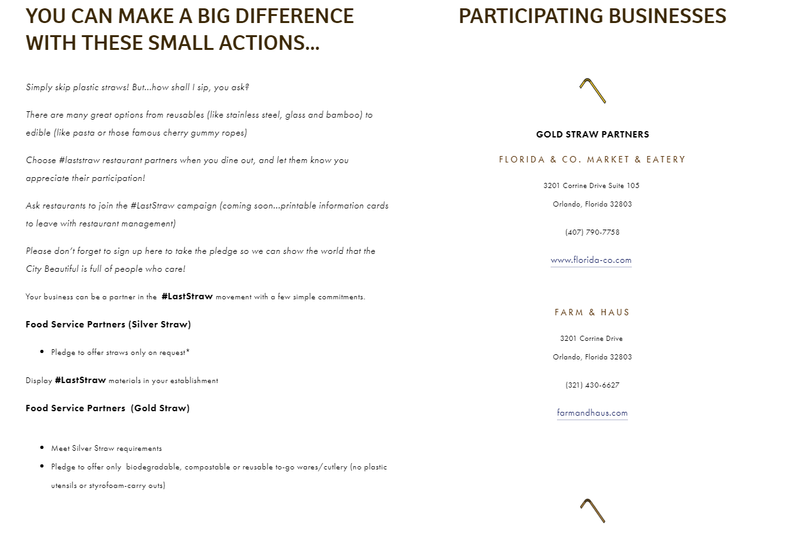 Participants receive a staff training guide, eco-friendly vendor list, & a promotional toolkit to educate employees and patrons. We could not meet our goals without our team of selfless, committed volunteers. Our community business partners also provide essential contributions in the form of designing and producing public awareness tools. Finally, Orlando’s focus on sustainability creates the community environment necessary for our organization and campaign to thrive. Our main stumbling blocks were money and organizational support -- without funds to produce the materials and website, and key community members to spread the word, our campaign could never take off. Fortunately, several individual and community donors provided monetary support at our meetings and outreach efforts, and we found grants to cover additional costs. 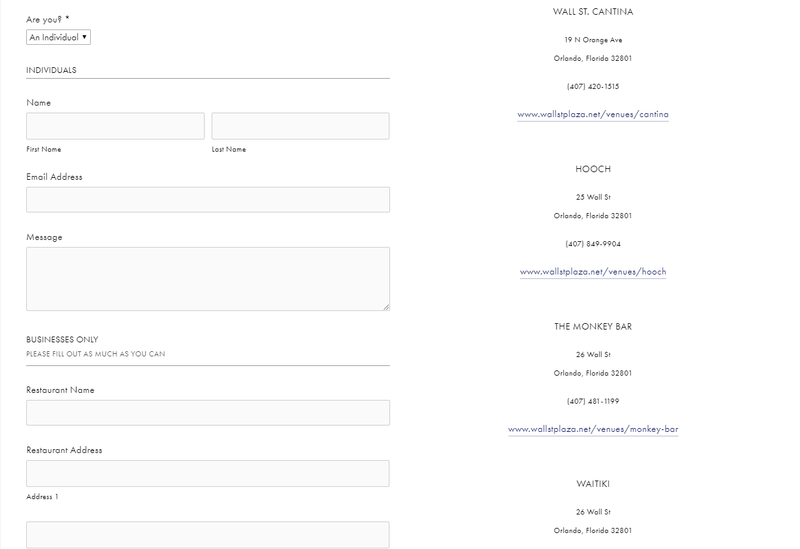 Through outreach we also met eager partner organizations with surprising connections around Orlando, engaging with communities we never could have reached otherwise. We secured help from two local partner companies: Corkcicle, which manufactures reusable cups, mugs, and straws; and Little Architecture, an international architecture and design firm. These two groups collaborated on #LastStraw to develop advertising and promo materials such as brochures, window clings, and billboards. We also found operational support from the Orlando Tech Association and their Momentum initiative in presenting #LastStraw at a meeting, in turn heightening sustainability awareness in Orlando’s burgeoning tech industry. Local college volunteers will also spread word-of-mouth about #LastStraw and actively recruit businesses through the Phone Hack-a-Thon. By participating, these volunteers promote sustainability at their alma maters, ideally generating more awareness and support for sustainability in academia. The more students and young people exposed to sustainability, the more grassroots support sustainability will enjoy. The connections made with local businesses additionally help expand industry awareness of sustainability and the benefits it can offer, with potentially far-reaching improvements in corporate responsibility and cost-savings for Orlando industries who adopt best practices. Finally, we hope that the buzz and momentum generated by our campaign will reach decision- and policy-makers in Orlando and the entire state. Once communities see the benefits of plastic waste reduction, we hope they will join the overall sustainability movement. Though our project is still in the soft-launch phase and we are still recruiting individual and business partners, we already have demonstrable progress. Bars in the Orlando Wall Street Plaza who have taken the straws-on-request model pledge have reported 75% reductions in plastic straw usage by patrons. We expect both the Wall Street bars and other business partners to enjoy further reductions as time goes on - perhaps nearly eliminating altogether the need to purchase plastic straws. According to a success story found at http://www.chicagotribune.com/business/ct-biz-plastic-straw-alertnatives-20180202-story.html, the New York bar/event space Freehold Brooklyn reduced plastic straw usage significantly from 2016 to 2018 - from 1.5 million yearly at $9,000 all the way down to 6 straws weekly, which would amount to 312 straws a year at a proportional yearly cost of $1.87. In this context, achieving 75% reductions in only a few months speaks promisingly for our eventual final results. As our project is ongoing, we have no overall impact figures. However, we can describe our measurement methods. Most straws use #5 Polypropylene, with a ratio of 1.67 lbs CO2e per lb plastic (http://www.worldcentric.org/about-compostables/eco-profiles/plastics); we use this figure along with a straw’s ~1.5 oz weight to get a value of ~0.1566 lbs CO2e per straw. To estimate individuals’ reductions, we average U.S. straw use to ~280 million per day (from the 170 million and 390 million per day figures found at https://www.nytimes.com/2018/07/19/business/plastic-straws-ban-fact-check-nyt.html), and divide by the current U.S. population of ~329,250,000 to get daily per capita use of ~0.85 straws. We combine this figure with our final pledge count, project timeframe, and the per-straw emissions value to estimate the straws and emissions saved. For businesses, we combine our per-straw emissions value with observed differences in straw use before and after they adopt on-request models. A major co-benefit is reduced consumption of world plastic stocks, due to lower single-use plastic demand; this benefit falls under economic / sustainable development by preserving plastic’s limited supplies. Ideally, campaign participants also adopt further plastic-reducing behaviours such as bringing their own water bottles; these behaviours offer multiple positive impacts by reducing community waste and uniting community members (community / social), reducing plastic and microplastic pollution (conservation, water), and lowering impacts from unsustainable businesses like bottled water (economic / sustainable development). Reduction of plastic straws has a beneficial impact for wildlife, especially life under water - a biodiversity conservation benefit. 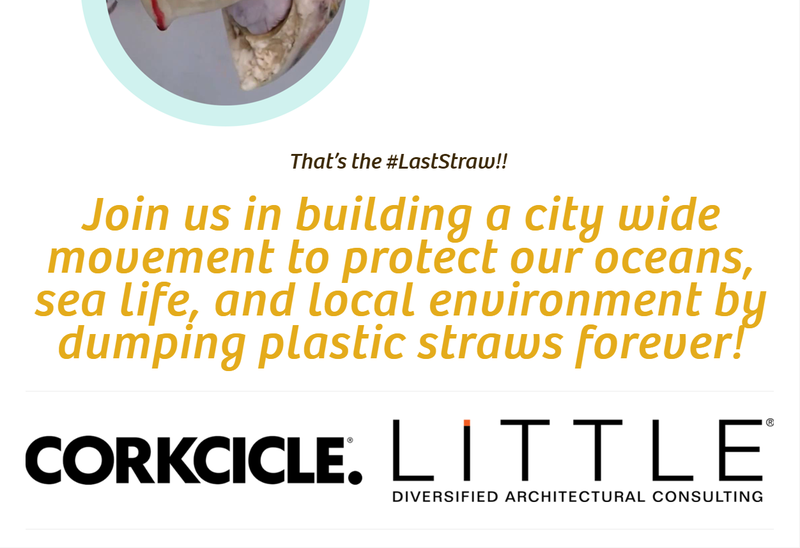 Finally, #LastStraw-focused social events (Orlando Surf Expo, Wall Street #LastStraw Party) host educational booths and activities to engage consumers around other waste-based topics, fostering further community and social action. Our solution relies both on grant funding and market-based revenue. We seek grant funding to support our public outreach and advocacy efforts, especially awareness marketing materials to distribute to our partner locations. We also partner with local and national manufacturers and distributors of restaurant and food supplies. By partnering with these manufacturers, we spread the word about their sustainable products and drive sales by presenting them as attractive alternatives to unsustainable plastic products. In exchange, our business partners agree to percentage-of-proceeds agreements that raise money for both the business and our organization, potentially offering consumer discounts as well. The program has been developed with community partners offering non-invoiced in-kind services, donated in the areas of design, marketing, communications and web-development. Partners include Orlando Tech Association, AWS Hosting Services, Corkcicle, Little Architecture, Purpose Pioneers, and User Testing. Our only out-of-pocket expense is for printed materials, for which we estimate a total cost of $1,100. As our project is still ongoing, we cannot yet provide definitive information about results compared to our investment; however, we are satisfied with both the quality of the produced materials and the strength of community engagement, & we believe our results will also be satisfactory and well worth the costs. Similarly-directed campaigns already exist elsewhere in the country, usually executed on a municipal scale as this project is; however, impact statistics on these initiatives are not readily available through web search. Required funding for such an initiative will differ based on number of community engagement channels and coverage pursued, as well as number of businesses pledging their support and requesting promotional materials. We’re fortunate that our community partners are willing to provide in-kind services, which have dramatically reduced our operational costs for this campaign; indeed, due to our limited budgets, their assistance has been vital. 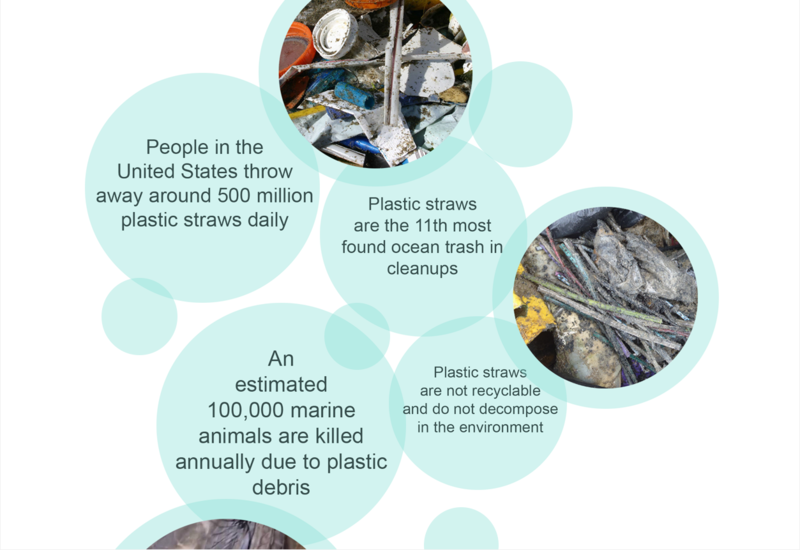 Our campaign makes use of informational flyers, posters, take-home cards, and window clings given to participating businesses; these items serve to inform clientele about the business’s commitment to the Last Straw campaign and to encourage individual commitments away from single-use plastics.